My C.A.S.E. Studies: MISTI May-nia! Lovely card. Thanks for the video, too. And for the prize opportunity. I love my regular MISTI, but would love to have the mini, too. Your card is so beautiful!Love the colors. And what a great idea to use the MISTI to hold your die cut down while you are painting! Thanks so much for sharing and for the chance to win. I hope so much to win the misti, but if not, this giveaway is giving me the oportunity to know different craft bloggers! What a fabulous card! Love the happy colours! Such beautiful spring colors! Love how intricate the card is! Your card is GORGEOUS. I love all the wonderful Misti tips in your video. Thanks for sharing. Very pretty card. Thank you for the giveaway :). Beautiful card, love the idea for using Misti in this way. Thank you for the chance to win the Misti! Thanks for the great ideas. Love the card. What a colorful beautiful card. Thanks for the chance to win a Misti! Lovely card and great tips on the video. Would love a chance to win the Misti. What ag reat idea for using the misti! I'd love one. Would love having the Misti! Nice offer! This time of year, almost everywhere, we are ready for those beautifully colored flowers! Spring has sprung! Pretty card. Loved the colors! I LOVE watching your videos! Thank you so much for your inspiration! 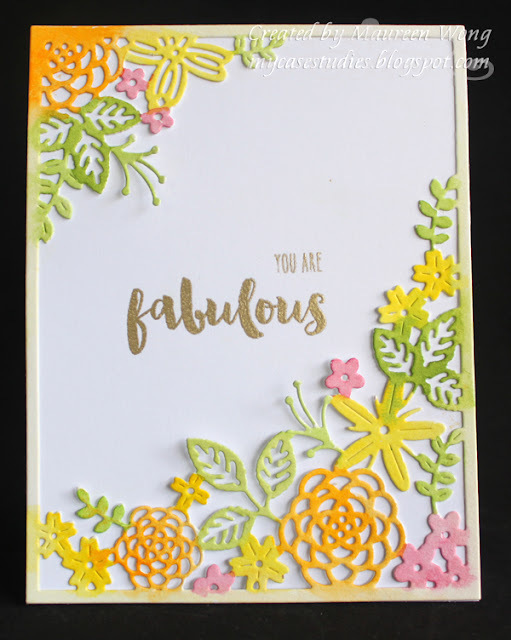 Wow - "Fabulous" card! So pretty! That die cut is gorgeous. Would love to own a mini Misti - thanks for the chance! Aloha! What a beautiful card you created Maureen! Your video is jampack full of great tips. Thanks! 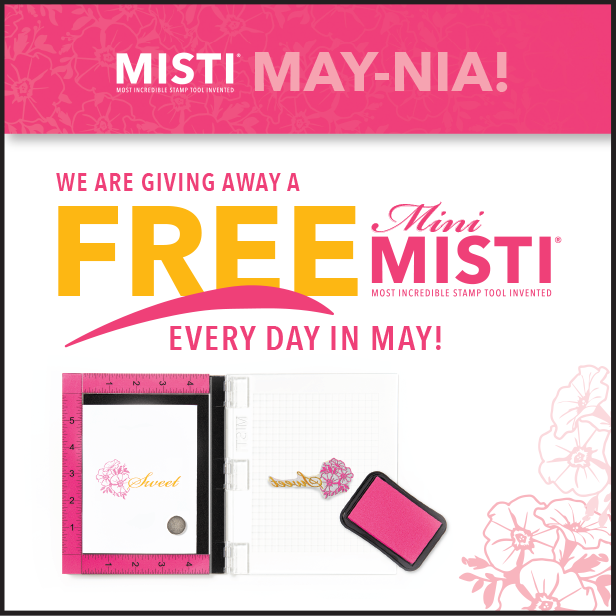 And thank you for the opportunity to win such a fabulous prize, the mini MISTI. Your card is perfect. I love the colors and style of your card. Love it!! Your card is simply fabulous! Love the colors, design and your video! Great use of the Misti! Beautiful card! I'll be sure to remember your tips if I ever have a Misti. I'm enjoying all of these blog posts showing the Misti in use. Fabulous card! (pun intended :D) And thanks for the opportunity to win a mini MISTI. Beautiful card. I have this die, thanks for the inspiration for another idea to use it. What great tips and beautiful card! Gorgeous card and great tips! Thank You so much! Love your card and wonderful tips. Thanks for sharing. Thanks for a chance at winning the Mini Misti. Wow. Your card is beautiful. Beautiful card. Love the spring colors. DELIGHTFUL card and FABULOUS video Maureen!!! LOVE how you have coloured your DELICATE floral panel and REALLY appreciate your CLEVER ways of using the MISTI => THANK YOU SO MUCH for sharing!!! BE-U-TI-FUL!! Thanks so much for the tip on covering the magnets... I get so frustrated trying to separate them! Cool use for a bead container, too. : ) Love the idea of using the MISTI to hold something rather than taping it down! Love the card. Great video! Your card is beautiful and thank you for those tips for using the MISTI for other than just stamping. Brilliant! The card is beautiful! I enjoyed the tip on the magnets too. Thanks for the sweet giveaway chance! Beautiful card and great tips for using the Mini MISTI. Thank you for your video! I would love to win - thanks so much and Happy MISTI May-nia! The MISTI is so versatile! Love the card from yesterday, with the gray, too. Absolutely beautiful! And thanks so much for the video! I love the water colouring on the die. I wouldn't have thought of that! Thanks for sharing. What a beautiful card! You do a great job on your videos! I love all of the tips you share! Your card is so delightful in color and design!! Beautiful card! Thanks for the great video!! Love your bright, springy card! Thank you for the tips in using the Mini MISTI! Two invaluable takeaways from your post. First, wrapping the magnets in tape...I have arthritis in my hands, and don't use the magnets because I can never get them unstuck from each other. Game changer for me! Second, putting a wash cloth under the watercolor paper...good idea to keep from getting your grid pad soaked and warped. Thank you! Beautiful and artistic work. Your link from Sweet Petunia isn't working though! Beautiful card ! Thank you for the clear video all the useful tips you are sharing ! Such a super cute card! Love the colors :)! New follower and such a great video. Thanks for the tips! Lovely video and a truly beautiful card. Well...that card is looking pretty fabulous! What a great card, I think I can do this!! Love the MISTI, and the card inspiration! Your card is so pretty Maureen! Love all of the fresh spring colours and the way you used them on that coverplate. Thanks for a chance to win a Misti - sure could use one of those, have lost track of how many cards I have ruined with a misplaced sentiment. Gorgeous card! I love seeing a new way to use the MISTI! Looks like a fabulous tool! Love this gorgeous card! The colors are so springlike. Loved all the good tips from your video. Thanks! Beautiful card! Thanks for the great ideas on using the Misti! Your video was very helpful. Thank you so much for the chance to win! Very pretty card, and thanks for the tips. Beautiful card. Loved all your tips using the Misti. Well, wish I was in Hawaii with you. LOL. Thanks for sharing. Thanks for the tips and love the card!!!!! Your card is so beautiful; thank you for the video because I was wondering "now, how did she do that?" Loved the way you present these fabulous ideas in your video. Card turned out so very nice. Thanks! I do follow your blog and love it. Thank you for keeping it up. You are always coming up with new and exciting ideas. Thanks for sharing! Such a beautiful card. Great tip on the towel over the MISTI...thanks for the great inspiration!! I learned so many great tips from your video thanks for sharing. The tape on the magnets is genius as well as rubbing from the back side of the card! I do subscribe to your blog. It's so inspiring and I look forward to your beautiful cards and projects. Also, winning a mini Misti would be awesome. That is a beautiful spring card! Great way to show how to make your stamps perfectly straight, especially using it with a die and getting it perfectly centered. Great tip! Thanks for this idea. I've never thought of using my Misti this way. You are a Misti genius! Great card and fantastic tip with the magnets, off to your blog to see if I missed anything, even though I'm a subscriber! Beautiful card, love the watercoloring. What a clever idea to use the MISTI to hold the project in place. TFS! Beautiful card and fun techniques!! I like the ways you use the magnets to secure your project while you are working on it. Thanks for sharing and for the chance to win!! Love the watercolors!! Awesome use of the Misti! Love the fresh colors and happy feel of your card! Thanks for sharing a video with us! What a beautiful way to use frame die cuts! Oh my goodness; thank you so much for the chance to win a MISTI! I love your work; I can tell how much thought and care you put into it. Thank you for sharing... I'm following you on youtube! This is a gorgeous card. Thanks for sharing your beautiful creations. Your card is so beautiful! Enjoyed the video. Great card! 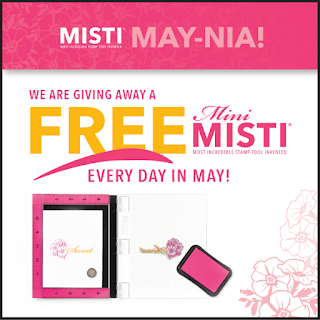 Thanks for a chance to win a MISTI! Beautiful card. I love the different ways you show to use the Misti. Thanks for sharing. Wonderful card! Thanks for the chance to win a Misti! I know I can put it to good use! Beautiful. Thanks for making the video. I have ordered one of the frame dies and now when it gets here, I know what I am going to do with it. Also, thanks for the opportunity to win a MISTI. So beautiful and delicate. Great use of the misti. tfs! The card is gorgeous and I love the fact that you used the misti to hold down the die cut to paint and glue it. Clever. Thanks for sharing your tips. Love the card. What a beautiful card and I can see how the Mini-Misti would be so handy. Thanks so much for the chance to win one!!!!! Beautiful card. Thanks for sharing your coloring tips. Another use for the MISTI. I love your beautiful spring-y card! Wonderful colors! Gorgeous card! Thank you for sharing it! "FABULOUS" card. Love the bright spring colours. Wow, love your little tip about adding a tail to your magnets for easier handling! I don't have a MISTI at all yet but have been watching videos and posts to see what it's all about. I can see how stamping a sentiment on a card design is so much more exact with this fabulous tool! That card is gorgeous! Thanks for the chance to win a Misti! Pretty card. I used a MISTI for the first time at a friends house and I am hooked. What a pretty card! I really appreciate your tips regarding the use of the MISTI-wouldn't have thought of those. Thanks for the giveaway. Your card is really beautiful and I enjoyed watching you put it together on your video. You are so inspiring and I appreciate all the tips you share. That pretty spring die cut frame is really the perfect frame for your card. I have never tried a MISTI but it looks like a great tool for any stamper. I'm loving all the little tips and hints on how to best use it and can see that I may just have to get one! This is so sweet! I love the Misti- wish I had one! Beautiful spring card..love the dies and the use of the misti. I love your card! It's so happy and fun! I am drooling over the Garden Gild set. I will have to order it next month. I love the colorful design against the clean white background. Thanks for sharing different ways to use the MISTI. Your card is lovely and cheerful. I also had to check out the Garden Gild Kit. Thank you for the tutorial and creative energy. Your card is stunning. Super cute card and great video!! Beautiful card and thanks for the great video!!! Thank you for the great video on how to use the Misti! Beautiful card! I follow you on Bloglovin'. You are one of the reasons I bought my Misti. Your tutorials are great. I LOVE this card! I have never seen this technique, I will definitely try This! Thanks for sharing. I love that die cut. Great card. LOVE LOVE LOVE to win!!!! Love the layout and die, so many possibilities! Thanks for chance to win! Beautiful card! Love all your tips - like taping your magnets and using them to hold the diecut while painting! Wow! The colors are beautiful. That is really lovely and delicate card! One of the great things about the MISTI Maynia for me is that I am getting introduced to lots of great card makers. Thanks. Love your card and colors!! Love being part of Misti Maynia!! Super pretty card!!! Thanks for the chance to win! So pretty! I learned some great tips in the video--thanks! I enjoyed learning some new ways to use the Misti - great tips! And a pretty card, too! Love the video. Thanks for inspiring me. Gorgeous card. I love learning new techniques. Thanks so much for sharing and for participating in MISTI May-nia. Love the idea of the tape on the magnets. Love your Spring-y card! Thanks for the mini MISTI ideas! I really liked the creative ways you used your Misti. Your card is lovely. Such a gorgeous card and design! I love the shaded flowers, they looks so pretty! The sentiment looks so elegant too! Thanks for the great tutorial you provided and for sharing your inspirational project! Beautiful card. Great tutorial. Thanks so much. Oh my gosh!!! This card is so adorable! I love your technique and new ways of using the mini Misti. Thank you for sharing! I absolutely love your card! It's so colorful. Thanks for the chance to win a MISTI. Fabulous card and thanks for showing how you used the Misti to create it. Thanks for sharing such a bright and beautiful card. Also appreciate Misti-May-nia!!! What a pretty card! I love the coloring on the coverplate! Love that floral die! Thanks for the chance to win a Misti! Beautiful card, Maureen, and great video! Thanks for the tips for using the MISTI. Would love to win a MINI. Thank you for the video and the opportunity to win a Misti! Your card was beautiful and I learned a few new techniques! Thank you for a Spring-y inspiration! beautiful card and great tips for using the misti! I don't have a MISTI so I sure would like to win. Your card is so beautiful!! I can't wait to give it a try. TFS! What a what a gorgeous card! I adore the color combination too! Thanks for the opportunity to win a MISTI! I love your card. The misti tool looks like it would help a lot . beautiful technique and your video shows the versatility of the MISTI! Lovely card! I always look for your videos on YouTube to get great ideas for using a MISTI. I live your color choices on this card. It just makes me smile! Love the ombre colors and great video! Great mix of colors-very unique! The Misti is very unique too!